Justin Trudeau's widely publicized revelations of pot use may force him to pull a U-turn at the U.S. border, says a lawyer who's had clients in similar situations. But it's not just the Liberal leader who faces this potential dilemma. Immigration lawyer Len Saunders told The Huffington Post Canada that Trudeau, and any other Canadians who have been open about smoking marijuana, can expect to be turned back at the border. In August, Trudeau told HuffPost he dabbled with a doobie after becoming an MP. And although the candid confession netted him plenty of praise from the public and his own party, it also drew flak from the Harper government. Federal Justice Minister Peter MacKay was quick to pounce, saying the Liberal leader set a "poor example" by breaking the law. However, an Ottawa-based law professor accused MacKay of misleading the public, pointing out that while is illegal to grow, traffic or possess marijuana, smoking pot is not a criminal offence. Still, Saunders said that not only is merely admitting to smoking pot in the past a magnet for trouble — even if there weren't any convictions, arrests or charges — but any online evidence of an admission could be used to deny a Canadian entry across the border. That puts other Canadian politicians who disclosed their own past puffing after Trudeau's admission — from Toronto Mayor Rob Ford to Nova Scotia Premier Darrell Dexter — in the same "inadmissible" boat as Trudeau. "The thing is at some point, [Trudeau] will be asked [and] they'll Google search him. 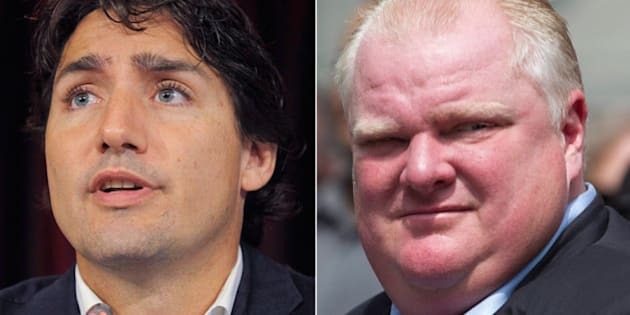 And if you Google search Justin Trudeau right now I'm sure the first thing which comes up is him admitting to drug use," Saunders said. "Any officer doing his or her job is going to see that and say 'sir, you admitted to using these drugs, is this true'?" Saunders, a Canadian-born American citizen whose firm is based in Blaine, Washington, said he thinks his clients who were denied entry for their confessions would be "unhappy" if Trudeau was treated differently. "If everyone is supposed to be treated the same, then he should be denied entry," he said. Jessica Goldstein is among the most recent Canadians to be denied at the border over a pot-smoking confession. The 30-year-old university student told the Vancouver Sun she was rejected Saturday at the Douglas border crossing in B.C. for admitting she smoked pot a couple of days earlier. Andrew Feldmar knows the experience, too. The Canadian psychologist was turned back in 2006, according to Wired, after a border officer Googled his name and found research he had written about experimenting with LSD in the 1960's. "It's totally unfair, totally unjust," Feldmar told CTV News. "If they stopped everybody who has used illicit substances, nobody would be allowed into the United States." And if a conviction does exist, it doesn’t matter when it happened. Myles Wilkinson, a Vancouver Island resident who won an all-expense-paid trip to watch the Super Bowl final last year, was denied entry into the U.S for a marijuana possession conviction from 1981, the CBC reported in February. "I can't believe that this is happening, for something that happened 32 years ago,” he said. But there’s a way out. Or in this case, a way in. Saba Naqvi, a Vancouver-based immigration lawyer, says that while she doesn't believe online search results of Trudeau's admission are grounds for inadmissibility, she "would not be surprised if they told him he needs a waiver to get into the United States." "Whether they should be permitted to use it or not, that's a whole different question, but they often do use that to determine whether they're going to allow the person admission into the U.S," she said. Naqvi added the law states border officers must inform individuals of all the "essential elements" of the crime they admit to, meaning the traveller must get an opportunity to explain all the context and circumstances. She also said travellers who are in urgent need of entry to the U.S. but get denied can get exempted through humanitarian parole. Saunders agrees any Canadian denied entry must file for a waiver, which costs $585 at the port of entry and anywhere between $500 and $2,000 with a lawyer. Waivers take between six months to a year to be issued, Saunders added, and they aren't evergreen. Saunders recommends that Canadians travelling to the U.S. understand the difference between federal law and state law, but he sympathizes with those who answer the question truthfully — although he says you are under no obligation to do so. "What I tell people is there's two Washingtons: there's Washington State, where [pot is] legal, but then there's Washington D.C., where it's not legal, and it's the Washington D.C. that has jurisdiction over these ports of entry," he said. "What troubles people in situations like this is they're just being honest. They're just being honest, they're answering a question innocently that they think is not going to have, literally, life-time repercussions."